An American friend sent this. I laughed so much I cried. Shame the Labour Party here didn’t do this. There is every reason to expect a landslide in next week’s US elections. I expect Obama to win with more than 300 EVs, and the Dems to pick up maybe 8 Senate seats (VA, NM, AK, NC, CO, NH, OR, maybe MN and GA at a pinch) and 30-40 House seats. But, Faux News is at it again, touting the race as a “toss up”, narrower than the margin of error. So, one more time, here’s why they’re way out. Obama opened up a large gap in mid-September, and has maintained a large lead ever since, with a slight narrowing in recent days. This narrowing was expected, and is considered quite normal. Underpinning Obama’s continuing lead has been a realignment of perceptions of the candidates, reflected in the candidates’ favourability and trust ratings. Not only has the “horse race” been a picture of remarkable stability, but things have been getting worse for McCain in recent days. The race is about winning electoral votes state-by-state, and not the popular vote. Ask Al Gore. As of today, aggregating state-level polls shows Obama ahead by at least 8% in states with 272 EVs — enough to win — and by 6%–8% in states with a further 29 EVs and ahead in states with 56 EVs. And Obama is above 50% in the states where he is 6% or more ahead, except Ohio (49.5%). Apart from Missouri and Indiana (which remain toss-ups), the news in the last few days has been good for Obama: his lead has widened slightly in Florida, and remained steady in Ohio, Virginia, Colorado, New Mexico and Nevada. First, unlike NZ, turnout in the US has historically been a problem, so the data used are “likely voters” rather than registered voters. How do you know who’s “likely” to vote? Traditionally, pollsters put more weight on past voting behaviour as opposed to expressed intentions. Fine, for your average election. But this is not going to be an average election. Obama’s margin appears to be over 30% with young voters and over 80% of African American voters. Young voters and African Americans have tended to have low turnouts in the past. However, voting in the primaries, early voting so far in the 31 states that allow it, and unprecedented volunteer activity all point to this being an exceptional year for young and African American turnout. How much difference will this make to the result? Well, Gallup started producing two figures a couple of weeks ago, using the traditional likely voter model and an expanded one that gave greater weight to expressed intentions. The latter has been tracking at around 3–4% above the former, so that’s how much you could add to Obama’s figures in most national polls if you think that next week will see a massive turn-out. The so-called Bradley effect? As Mark Blumenthal says, “Much of the recent debate centers on whether the effect ever really existed (see the skeptical take by ABC’s Gary Langer) or whether it existed and then disappeared 10 or 15 years ago (see the exhaustive report [PDF] by Harvard political scientist Daniel Hopkins).” There wasn’t any evidence of such an effect in the primaries either, please note. Then there’s the cellphone-only voters. If anything, this adds another couple of percent to Obama’s total in the polls (here for earlier post). But what about those polls showing a narrow gap? Like that IBD/TIPP poll that Faux News was salivating over last week? Well, it showed McCain leading by 52 percentage points among 18- to 24-year-olds. Incredible. As in, not credible. The late deciders you say? (Well, McCain’s claiming they’ll vote his way when they get into the voting booths.) The best analysis suggests that they will split fairly evenly, maybe a little towards McCain. Anyway, even if he got every last one of them, he’d still be behind in the swing states, as Obama is over 50% already. This is a truly exciting contest, and it may be close, but it ain’t close yet. Update: Friday evening US-time: McCain claims, “We’re coming back strong.” Reality: RealClearPolitics poll average had Obama’s lead slipping from 8.0% on 25 October to 5.8% on 30 October. Now it’s back up to 6.5%. 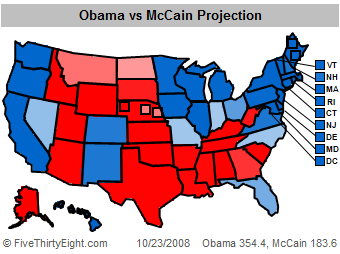 McCain’s own state is now categorized as a “toss up” and Obama’s campaign has started running ads there. Comeback?! Strong!? The ‘October Surprise’ is here!? “… its timing is curious, coming right at the end of the Bush administration’s period of office and at a moment when many of America’s European allies – like Britain and France – are trying to broaden their ties with Damascus. The US military says that it is “investigating”. If this is actually true, it’s just so damned transparent. People wouldn’t fall for this, would they? Why are ACT so bloody boorish? The Herald headline said it all: “Abuse hurled as Epsom candidates toe party line.” Thursday night’s Epsom candidates’ debate in a nutshell. With three long-serving MPs and one staunch wannabe (Rodney Hide, Richard Worth, Keith Locke and Kate Sutton), the debate promised a great deal. Edifying, though, it was not. For a start, it was televised. As well as “[giving] the candidates … a chance to tell viewers why they have the best policies for their constituents”, TVNZ 7’s Swing Seat shows also promise to “take viewers through the electorate, introduce the candidates and review their prospects.” What we got were silly little tours of the constiuency by the candidates, shallow questions and an emphasis on entertainment. Second, it was hard to hear what the candidates were saying most of the time, especially if you were sitting next to the ACT mob. These people were determined to (1) drown out their opponents — great defenders of free speech that they are — and (2) display their ignorance. They mostly succeeded, especially the ACT candidate sitting behind me. Sorry, Athol, but you’re still ranked too high at #45 on the party list. Just why are ACT activists so damned boorish? All they do is convince everyone that they’re thorough-going arseholes. Anyway, from what I could hear, Hide and Locke made the best of it, with Sutton and even Worth holding up well. A couple of women who I spoke with — National and Green — both thought highly of Sutton. Hide had a slick, clever line for every situation — he may be a clown, but he’s a clever one — and Locke tackled every issue with well marshalled arguments and facts. You can watch (here for links to on-demand) and decide for yourself. Not that any of this will make much difference to our votes in Epsom. Everybody I know here, including me, is voting for Worth (holding our noses). Sorry Kate and Keith. But we don’t expect to prevail over the Nats, who will all be voting for Hide, of course (and no doubt holding their noses). Yesterday’s post on the US presidential election is a little previous, according to some. It ends “I’m inclined to think that, as James Carville puts it, “You can call the dogs in, wet the fire, and lock up the house. The hunt is over.”” Here are the reasons why we can anticipate — short of a huge ‘October surprise’ — a big Obama victory. It’s even better for Obama when you look at the battleground states. Not only is he ahead in every state that Kerry won, but Bush 2004 states Iowa and New Mexico are strongly Obama, with Colorado, Ohio and Virginia not far behind. He’s a little ahead in Florida, Nevada, North Carolina, Missouri and Indiana according to RCP, but these are much closer. Incredibly, GOP strongholds Montana and North Dakota are now competitive. 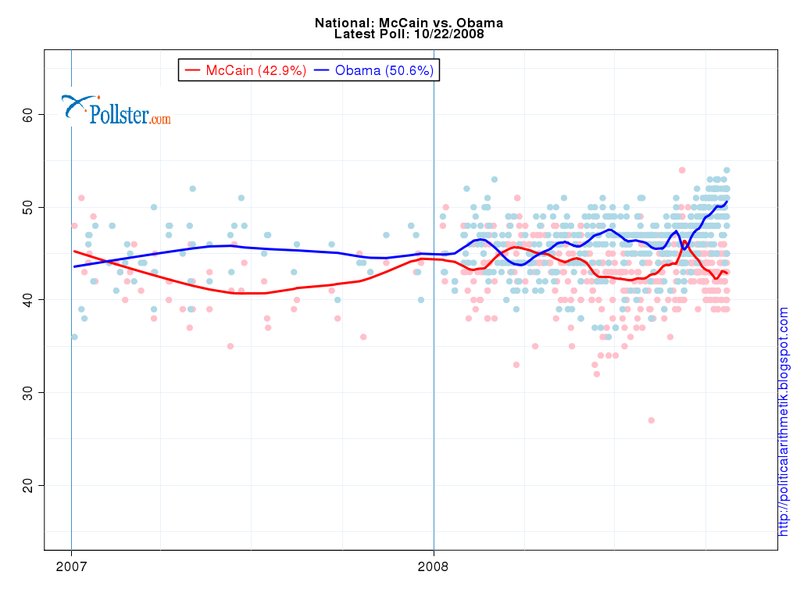 Obama dominates in the field, comprehensively out-spending and out-organising McCain. He raised $150 million last month alone. He’s purchasing half-hour blocks of prime-time national TV, while McCain is having to scale back his advertising spend in critical states. Even in the traditionally Republican states like North Carolina, Obama’s ground staff and volunteers out-number McCain’s by a factor of four or more. Worse for McCain, voting is underway in swing states North Carolina, Georgia, Ohio, Nevada, Colorado and Florida (in the latter two the early voting is expected to account for up to 60% and 50% respectively). Disproportionate numbers of those fronting up to the long queues are registered Democrats (absentee votes are another matter), evidence that the biggest and most sophisticated ‘get out the vote’ organisation in US history is working as it should. Looking at the big picture, winning this year was always going to be an uphill battle for any Republican. A phenomenally unpopular incumbent fighting an unpopular war was enough of a handicap, and then, only weeks out from the election, comes the worst financial crisis since the 1930s. Partisan identification greatly favours the Democrats this year. Still, the Republicans got off to a good start by chosing their best candidate for the conditions — someone with a track record of bucking the party, a maverick. With the right campaign strategy, McCain might have had a chance. But it’s hard to discern any strategy on McCain’s part, aside from playing things news cycle by news cycle and trying to destabilise Obama. They didn’t establish McCain as a serious player on the economy when they should have, and they didn’t undermine confidence in Obama when they might have. There have been huge blunders by McCain. “Suspending” the campaign (or pretending to) to meddle to no effect in the crisis talks in Washington was a silly gamble. Picking a no-nothing, egregiously unprepared right-wing nutbar as his running mate was idiotic. Palin energised the Republican base, galvanised the Democrats and alienated many lingering independents still susceptible to the (phony) maverick narrative (and a number of thoughtful Republicans, not least of which was Colin Powell). In terms of the underlying dynamics, Obama looks better by the day. He is slightly ahead with favourable ratings, and way ahead (behind) with unfavourables, giving him a net 23% compared to McCain’s 9%, according to RCP. He’s also ahead on everything excpet security, better liked, and seen to favour the rich a whole lot less than McCain. McCain’s campaign has also been losing at the symbolic level. Heroes don’t whine about how their opponents won’t play ball (joint appearances at ‘town hall’ meetings). They don’t get angry and petty and condescending just because their opponent is taken more seriously than they think right and proper. And straight-talking patriots don’t run campaigns that are divisive, rascist, dishonest and unrelentingly negative. Particularly in times of crisis. McCain has undermined his own narrative without any help from anyone else. Which has allowed Obama, in sharp contrast, to look presidential, authoritative, focussed and collected. Mr Cool. Squared. Not only is Obama a once-in-a-generation communicator and thoroughly brainy, he seems to have the instincts and confidence necessary to make the tough decisions that lie just ahead. A person for his times. Update: Friday night US-time, and RCP’s poll average has Obama at his highest level of support (50.4%) and the gap very close to its widest (at 7.9%). Watching Faux News yesterday you would have been amazed to hear that the US presidential election race is getting tighter. “Neck and neck” the caption read. Faux News was highlighting a poll that showed Obama only one point ahead of McCain. Their own poll showed Obama ahead by 9 points, but never mind that old thing. Couldn’t get much more “fair and balanced” than that, could you? There’s a spread from 1% (the AP poll that Faux News chose to report) to 11%. 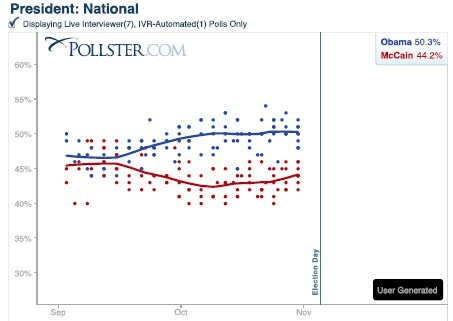 More importantly, these polls ticked Obama’s lead up for the fourth day in a row. So, yes, McCain gained a very small amount of ground around the weekend, but then… lost it again. The swiftboats never docked. That’s 354 Evs to 184. I’m inclined to think that, as James Carville puts it, “You can call the dogs in, wet the fire, and leave the house. The hunt is over.” Whatever Faux News says. Anybody who ever thought that a coalition deal between the Maori Party and National was possible needs their head read. Urgently. Nothing new there. But Espiner is wrong to say that confidence and supply is “highly unlikely”. Even more likely, should the numbers fall that way, is a tacit understanding that the Maori Party will abstain on confidence and supply, but retain the right to veto anything that it considers seriously unacceptable to Maori. Well, for a start, reporting any single poll as though it is fact — “has dropped to 3 points” — is arrant nonsense. It’s an insult to the listeners’ intelligence. 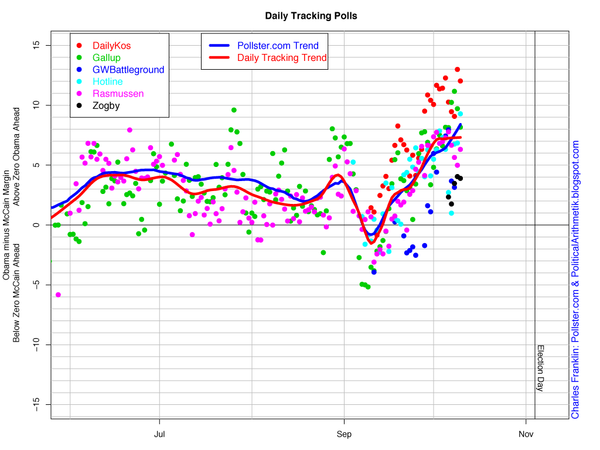 Report the averages of the polls, if you must. See those black dots below all the others, Radio NZ? That’s the poll whose results you have chosen to highlight. Dumb. Why cherry-pick the most unfavourable poll? This is exactly what Fox News and Drudge (here for details of Drudge’s bad spin) have been doing all week, in order to try to launch their “Comeback” narrative for McCain. But Radio NZ isn’t part of the Republican propaganda machine, is it? No, it did this because it used a news service that, like the others, misuses polls to try to make elections more interesting. It was lazy and/or ignorant. Not nearly as interesting is it? We taxpayers pay good money for a news service that is a cut above the commercial crowd, Radio New Zealand. You must do better than this. Update: Since posting yesterday, the RealClearPolitics poll average has increased Obama’s lead from 5.0% to 5.8%. And the Zogby poll? It now shows a 6% gap. And no mention of polls by Drudge for the first time in a week or more. Funny that. Update2: Oops! Monday night’s Zogby poll has Obama 50.3%, McCain 42.4%. Nary a mention on Drudge or Faux News. Or Radio New Zealand. More reality… You’ve just been compelled to downplay your attempts to whip up hate and hysteria, either because they clearly aren’t working or because you are uncomfortable with the ugly stain on the body politic that will be your lasting legacy. Or both. Over the last month, your negative advertising has been at 100% and your no-nothing disgrace of a running mate has been plunging ever deeper into the sewer in pursuit of votes. But your opponent has pulled ahead on practically every measure of confidence and favourability. Your own net favourability has been falling over the entire month. You still lead on security, but that’s it. You’ve managed to screw your own brand, without so much as smudging your opponent’s. You were supposed to be the straight-talking, independent-minded, tough, honourable one, remember? The war hero who could keep a cool head in times of crisis. When people are losing their jobs, homes and pension savings, they expect a little more than vague fear mongering about rather tenuous associations with a couple who never actually harmed anyone, a long time ago. The voters think that you’re more interested in personality attacks than policies. And they’re right. There are just three more weeks to go. Keep this up, Senator. Update: I should make it clear that the presidential race will likely tighten over the next few weeks. Despite recent gains Obama hasn’t by any means dispelled all the doubts many people retain, and the RNC is still poisoning the well with nasty ads. It is clear that McCain is trying to launch a “comeback narrative” with this speech. Drudge and Faux News have, for some days now, been highlighting any poll that shows the gap narrowing, despite all the other polls showing no such thing. It will be interesting to see, when the polls do eventually show the gap narrowing, whether the non-Republican media run with this “story”. Two loveable rogues say “Game is on”! Well that didn’t take long. Hot on the heels of the Morgan poll comes the TV3 poll (a.k.a. the accurate one) showing the gap between Labour and National halving, to six per cent (45% to 39%, with the Greens on 6.8%). When we last had an economic “meltdown” of this magnitude, the voters went initially with the conservatives, a cautious response to the economic turmoil. As in the US, the election looks to be turning on the question of who it is that voters feel safest with. If so, after the bungled tax package, expect the next poll (done after today) to be worse for National, not better.